I didn't get to sleep at all, no, no - I lay awake and watched until the morning light - washed away the darkness - LOL!! Anyway - this is a card I made with this cute little sheep stamp I just got - and for some reason it made me think of counting sheep while your trying to sleep. See the sheep jumping over the fence (the circle behind the fence turns) as you count from 100 - 99 - 98 - 97 - 96 - 95 - you get what I mean. I never have trouble sleeping - I stay up until 2 or 3 AM so I'm pretty tired at that point but I do fall right sleep and sleep soundly all night long!!!! Yesterday I said that I'd post some snow pics - it was so sunny and bright this morning when I went out that it didn't feel like 22 degrees when I went out to take some snow photo's. 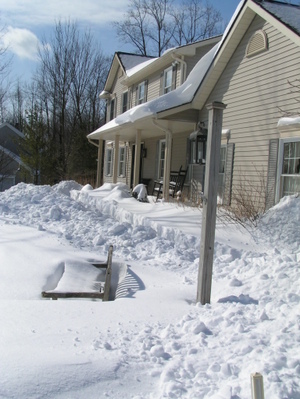 I hope you can get a sense of the amount of snow that fell!! 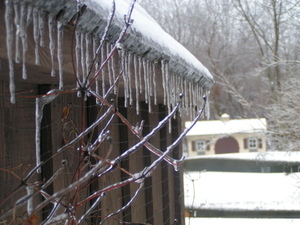 I'm first going to post some ice pics then the snow pics that followed the ice two days later. That was a good part of the weather problem here in Northeast Ohio - it was very icy out and then a huge blizzardy snow storm came on top of the sliding, slippery ice!! Created lots of problems. 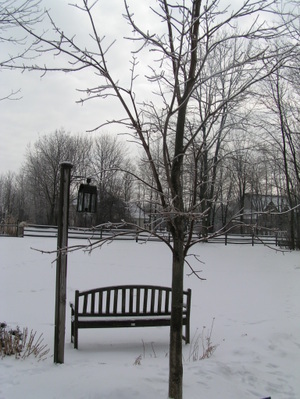 I'm going to show you two pics of the bench by the front walk - one is the ice photo and the other is the snow photo! 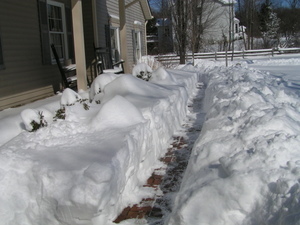 And finally the photo of the front walk - we do in fact have a front porch but it's all at the same level right now - well, until the snow melts at least. Stay Warm - Stay Safe!! OMGosh, FABulous and super CUTE card!!! I love your cards. I dare not show your snow pics to my hubby though - he would want to move there tomorrow so he could ride his snowmobile all over the place! I can tell you it's 50 here today and NOT raining - which for spring in Seattle is very unusual!